Combine everything except the pectin into a saucepan. Heat, stirring frequently until it comes to a boil. Reduce heat, cover pan and boil gently for 20 minutes, stirring occasionally. Transfer mixture to a blender and blend till smooth. Transfer back to the saucepan, add pectin, and bring back to a boil for 1 min. Transfer to hot jars and seal. Last Friday I enjoyed another visit to Multnomah Falls! 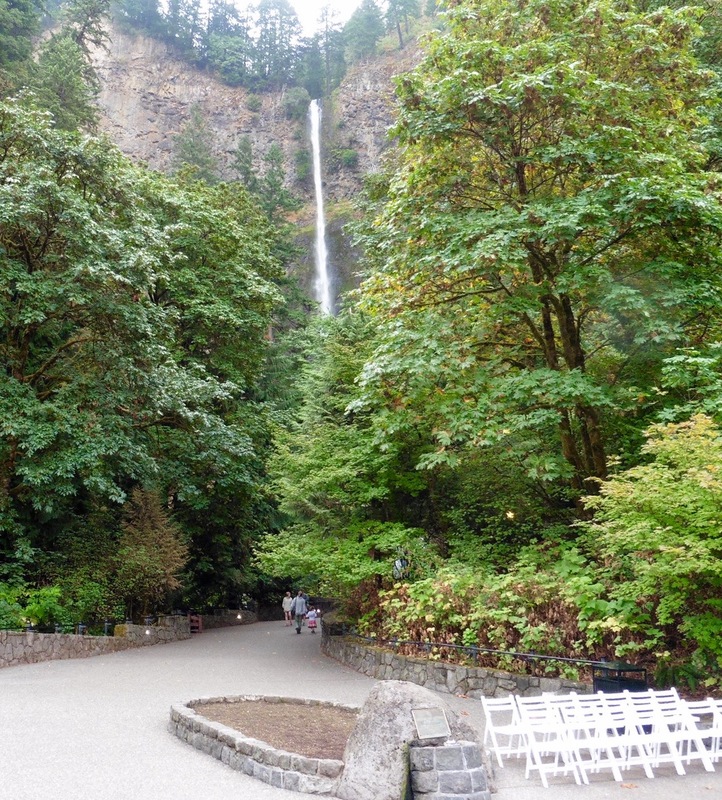 Teresa invited me to attend the 100th anniversary of Multnomah Falls being a public park. Reading the history of how this wonderful location was set aside to be enjoyed by all helped me appreciate it all the more. Individuals such as Simon Benson helped make the park possible. 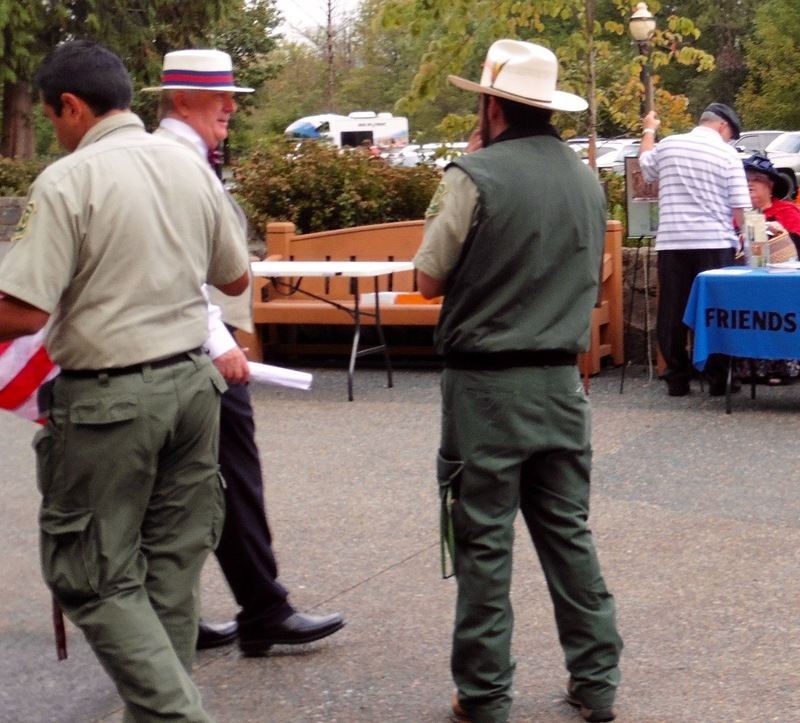 The 100th year celebration of the creation of the public park was news covered by some of our local news broadcasters. The celebration was made possible by the National Park Service, The Friends of Multnomah Falls, and others who worked together to make it so. My friends Teresa and Dayle Kasner [in the upper right corner of this photo] were among those who helped make the celebration successful. Driving home from the Falls I stopped at The Women's Forum overlook to take this view looking north up the Columbia river to Vista House. As I type to you I am appreciating once more folks like Dayle and Teresa who have contributed their support so that others can enjoy this view as well. Back at home with carrot cake jam in a jar on my table, I am also appreciating more beautiful dahlias and the crafting of others who have shared their talents with me. 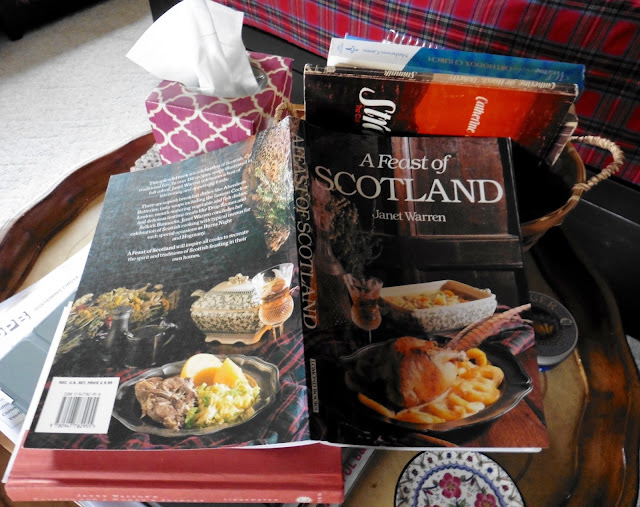 I read this interesting cookbook from cover to cover one evening after receiving it from my dear NY friend, Becky, last week. 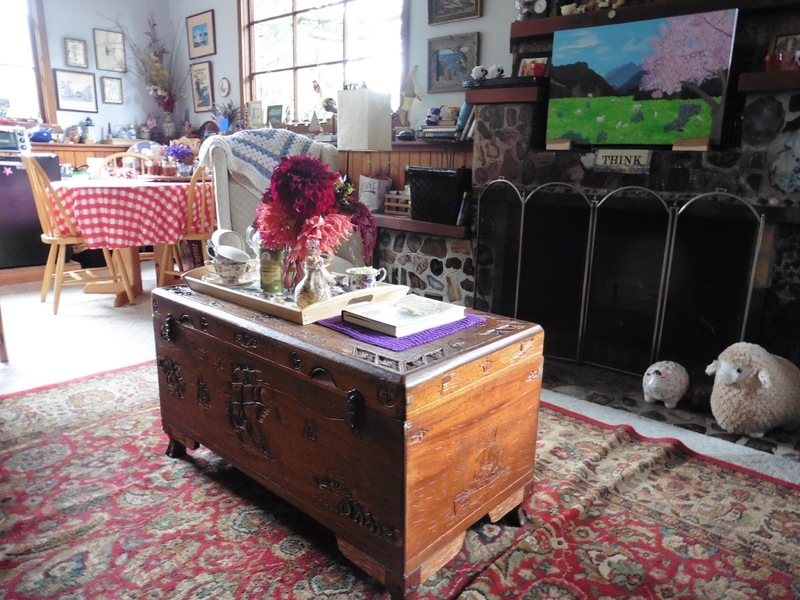 It is a wonderful combination of history, artwork, and recipes. Thank you again, Becky! I thought I had mentioned this, but Teresa told me I hadn't! My oldest daughter is expecting to introduce me to my youngest granddaughter, Sarah Josephine, around the end of November...in about ten weeks! My youngest daughter was hostess for a baby shower yesterday, and I made this little bib with a size D crochet hook for the baby. Folks round about me share their creativity and care in such sweet ways, and encourage me to go and do likewise. There are so many needs in the world, I often hide from them, but then I realize that each effort one makes to express love is worth it and helps our world to be more filled with love. While I was reading one of her blog posts, I listened to a song Clare crafted and performed and posted on her blog. I was inspired by how she is contributing to the cause of love by using her creativity to highlight the needs of the Syrian refugees. Congratulations for the exciting news on the addition to your family. 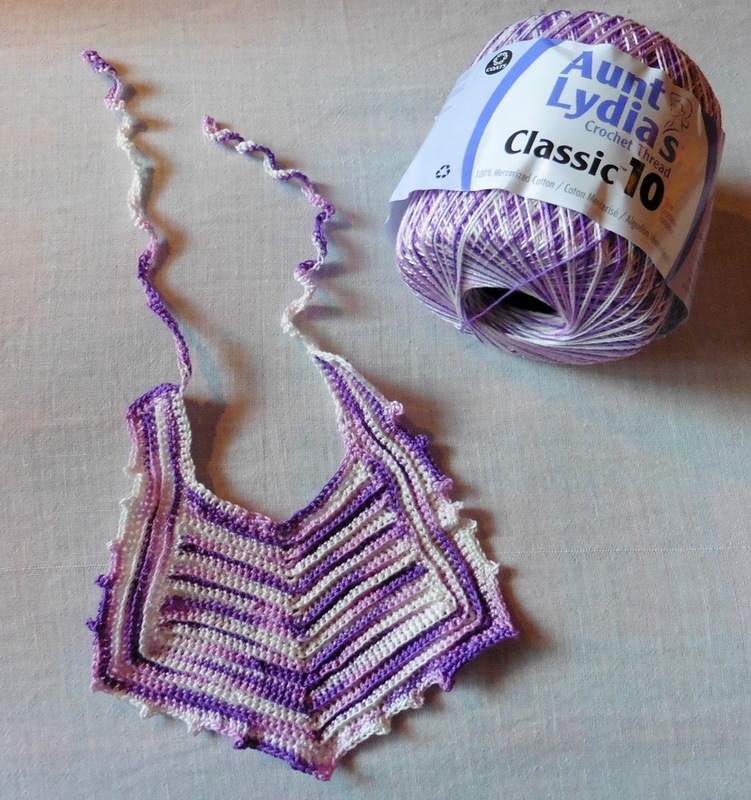 The bib for the baby shower is beautiful, such a lovely colour. Love the sound of the carrot cake jam, I will be giving that a go when I feel a little better I have a flu bug at the moment that is keeping me low. Thank you for the link to Clare's song. Your comment about each effort is worth it reminds me of Mother Teresa's quote 'Not all of us can do great things. But we can do small things with great love.' And we can continue to pray. 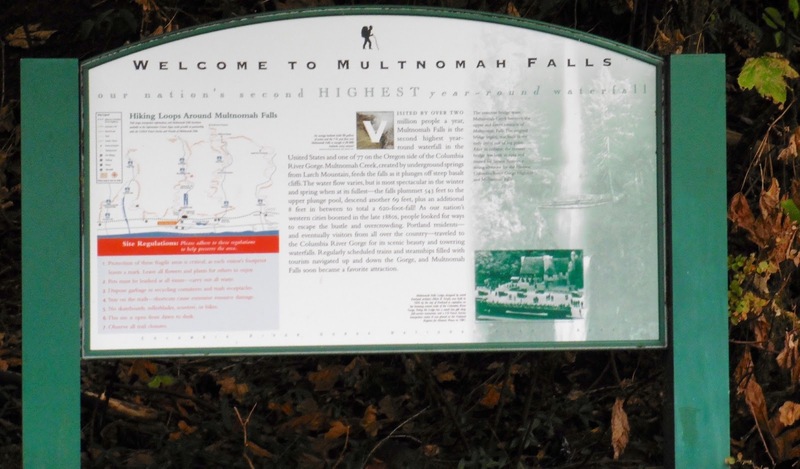 I love the photos of Multnomah Falls and the Columbia. Home! A new granddaughter Gracie!!! How exciting! That bib is just the sweetest little thing. So pretty. 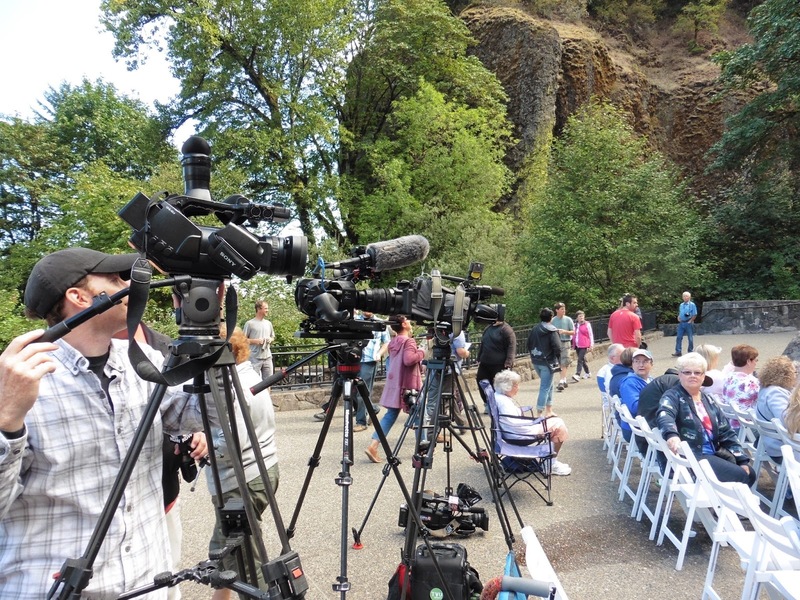 The day at Multnomah Falls looked like it was very well attended. 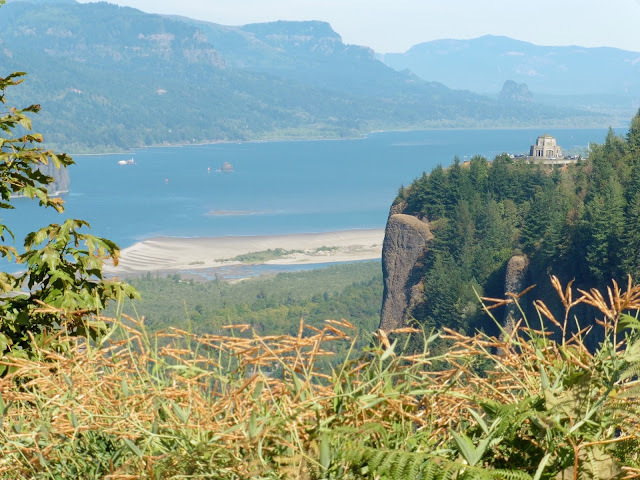 Teresa and Dayle have definitely done their part to keep the Falls and Vista House places where people can appreciate the sheer beauty that is western Oregon. Your new blanket looks so sweet and I know it will be appreciated by the baby and their family who receives it. I have fallen down on much of my crafting this summer. I just haven't done much at all but I hope that will begin to change soon. Lucky you getting to see the falls in person! I know it must be breath-taking to see it live and hear the water rushing. Your cake sounds wonderful! I'm making a carrot cake today (from a mix I wanted to try). I'll probably go with the traditional cream cheese frosting on it. We threw out the last of the pears from our tree yesterday. It produced a ton of pears...too many really, and we even shared with our neighbor. Congrats on your expected new grandbaby! That'll bring some new joy, won't it? Nothing like a new baby! How exciting to anticipate the birth of a brand new grandbaby. The bib is adorable and what a worthy cause you are contributing to. It is a difficult world, filled with pain and hardships for many people. You are making a difference. Thank you for the recipe Gracie...very interesting indeed. We don't have packaged pectin in UK so wil use 'Jam Sugar' as usual, that has added pectin and sets jam just as well. So glad you were able to share the park event with Teresa. Sweet little baby bib ... congrats on grandbaby-to-be. I visited Clare's blog. It is heartbreaking that so many are seeking refuge and yet are wanted by no one. They've already been through so much and are still being abused and mistreated. Horribly unjust. Thanks for the recipe - will definitely have to try that one. Hi Gracie, it's so nice to see an update. Congratulations on a new grandbaby-to-be! How exciting. I'm sure this baby will be spoiled with beautiful handmade things just like the others. :) Thanks for the carrot cake jam recipe, it sounds interested and delicious. Hope you're having a good week. Congrats on the expected grandchild! The blanket and bib you made/are making are lovely! And I enjoyed your photo of the falls and the one of Vista House overlooking the Columbia! What a wonderful post, Gracie! Traveling, crafting, a really interesting recipe and good news. Perfect. Just found your blog and am enjoying seeing another part of the world. I love seeing places in blogs. Scenery always seems to look so much bigger in the USA, probably is. 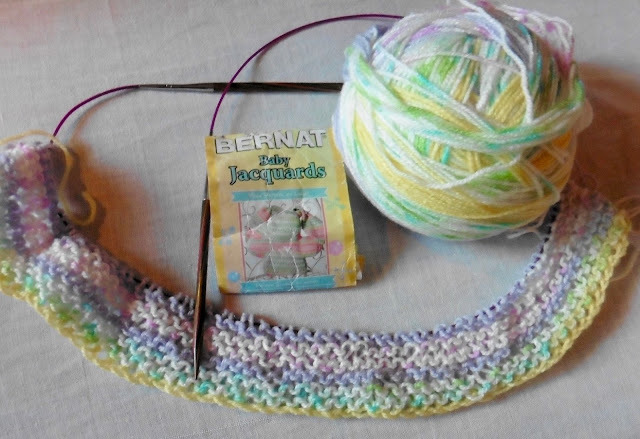 Plus (although) I don't blog about it myself) like to see what other people are knitting. Do you crochet too? You are always an inspiration Gracie, you put so much love and thought into every thing you do. The bid is beautiful. The baby blanket is going to be put to such good use. You are an angel. You're always such a busy lady, Gracie - such fun things that you do all the time! The jam sounds wonderful. I've never tried to make jam myself, but maybe next year when the fresh strawberries and raspberries are in. Thank you for the photos of the Multnomah Falls celebration. 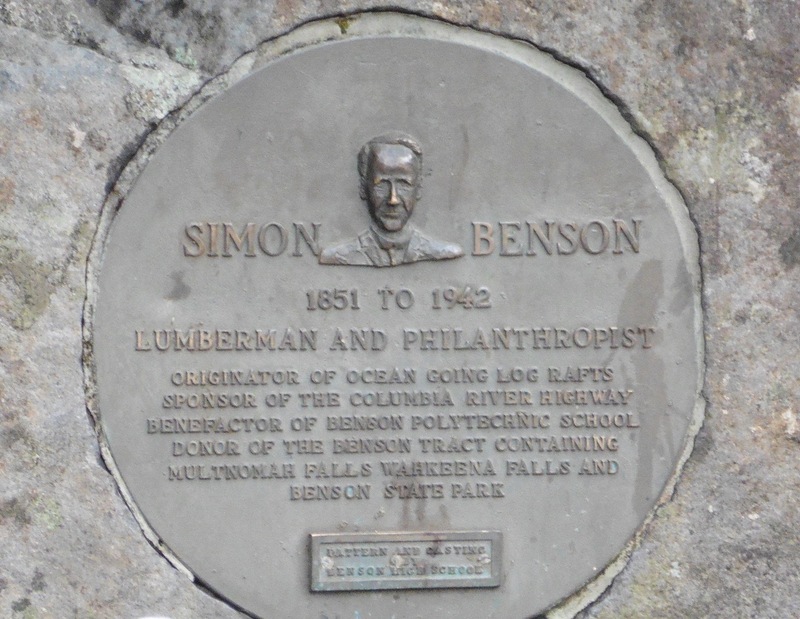 I believe Benson High School (as was) was named after Simon Benson. In the 1970s (and before) it was the technical high school, named after a man whose technical ability and imagination played a part in the Northwest. Congratulations on the grandbaby on the way!